As expected, the first real Mauritanian stage in the Sonangol Africa Eco Race was the least gratifying for both the bikes and the cars. In the end, Martin FONTYN imposed on two wheels and retook the lead in the rally whilst Jean Louis SCHLESSER and Anton SHIBALOV reinforced their advance in the car and lorry categories. Yesterday evening at the daily briefing, René METGE reminded us that Mauritania is a fabulous but pitiless land. The race Director of the Sonangol Africa Eco Race couldn’t underline this fact enough. 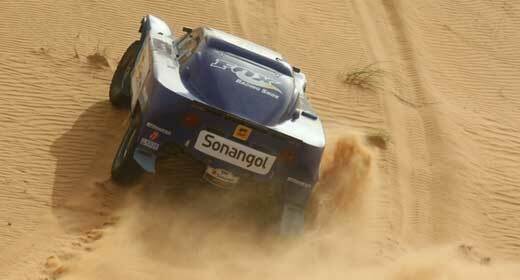 The 7th stage between Chami and Akjoujt did it’s damage to the rally caravan. This morning, a slight sandy wind swept across the start line, not far from the Chami camp. Around fifteen minutes separated Jean Louis SCHLESSER and Jérôme PELICHET overall. The leader expected to have a difficult day whilst his opponent hoped that his four wheel drive TOYOTA Pick Up would give him the advantage when following the Sonangol buggy in the sand. Unfortuntely for PELICHET, things didn’t quite go to plan and Jean Louis SCHLESSER took his 5th victory in 6 Specials. 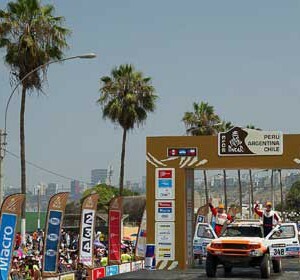 Jérôme PELICHET was delayed when he got stuck in the sand four times and only managed to cross the finish line in 15th position, 2:47’31’’ from the leader. A poor performance that took him down to 4th place overall behind the KAMAZ of Anton SHIBALOV and the HUMMER of Miroslav ZAPLETAL. We should also mention some great buggy performances from Thierry and Sophie BUNEL GOURDY, 7th in front of Yves and Jean FROMONT as well as the amiable Belgian driver Rudy GOEMINNE. On the other hand, some lost a lot of time today. We found Mido ABOUYOUSSEF stuck in the sand awaiting the support lorry to come to help him and also Louis BURTON, planted in a dust bowl who risked spending the night under a starry Mauritanian desert sky. Others who got back to camp eventually but lost time were Hubert AURIOL, 23rd after gearbox problems, Gilles FLORIN in 26th position and Portuguese Paulo FERREIRA, 28th and nearly 4 hours off the pace when this morning he was in the top 5. Some of the trucks also suffered, such as the MAN of Elisabete JACINTO who fell victim to a monstrous crash and finished 3:41′ from the leader. There were also difficulties for the MAN of Ronny FRANSSEN and Philip HELEWAUT who had to dig themselves out of trouble. On the other hand, everything went well for the KAMAZ of Anton SHIBALOV, 2nd on scratch in front of the TATRA of Tomas TOMECEK, only 16’27” from SCHLESSER. It was also a brilliant stage for Miklos KOVACS in his SCANIA as he finished in 10th position in the car-lorry classification. Overall, Jean Louis SCHLESSER now has a 2:05’34” advantage over the KAMAZ of Anton SHIBALOV and 2:41’31” on Miroslav ZAPLETAL whilst Jérôme PELICHET is in 4th position a little more than 3 hours behind. In the lorry category, the KAMAZ is still in the lead in front of the TATRA of Tomas TOMECEK and the MAN of Elisabete JACINTO. In 450, although Helly FRAUWALLNER on his YAMAHA and Joseph PALACIOS on his KTM got ahead, Patrick ARNOULT hung on to the first place overall on his HONDA. Tomorrow, the 8th stage in the form of a 477 km loop will circle around Akjoujt where 320 km promises to produce problems. It’s certain that some will get back to the camp late and highly likely that a number of participants will spend the night repairing damage… Watch this space!